do e-books furnish a room? 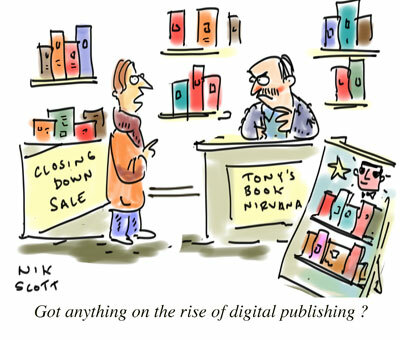 The word is that e-books are killing traditional publishing and it appears that bookstores already hit badly by the big chains (now defunct) and then by Amazon are now having to close to due to the increasing rise of digital e-readers. Publishers are freaking out and people like me who provide illustrations to publishers are finding themselves wondering about a career in banking. My take is all might not be as bad as it seems. I confess to being an e-book junkie. Before, I was simply a book junkie. Over the last two or three years I've downloaded many free out of print (Project Gutenberg etc) texts that I'd have a lot of trouble sourcing from regular haunts and many new texts from online bookstores. I've subscribed to various digi-newspapers and, like so many others, have thrilled to the instant gratification of getting almost any book I want on my machine with no fuss at any time of day or night. I've read hundreds of books on my e-reader and intend on reading hundreds more. However, I like to re-read books. I like to lend them to friends. I like to use them for research purposes and I like to see them in my bookcases. Once read on an e-reader a text slides back into the grey murkiness of an index and unless directly sought will not attract the eye. A book on a shelf will exchange glances with me as I walk by. It'll remind me of its contents. I can pick it up and browse through it. 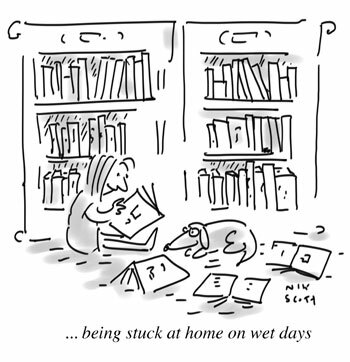 I learned to enjoy reading by being stuck at home on wet days and being able to fossick through the books of my parents. I'm hoping my daughter will do exactly the same thing when confronted with my collection. I know absolutely that she's not going to get much joy from clicking through an index on my e-reader. If I'm writing an essay I need to have several books open at the same time in order to collate information. No device can replace this system effectively. Having to flick back and forth hunting for bookmarks on a machine is time consuming. Already teacher friends of mine are telling me that their students are complaining about this aspect of the digital revolution. The same goes for art books, 'how to' books and so on. Agreed an art book can look lovely on an ipad but in no way can it replace a beautiful folio edition that can sit on a coffee table and impress my hipster friends. Also many e-books are much more expensive than a decent hardback reading copy. It makes little sense to pay for a digital version of something if one is not in a hurry and if the price is wrong. I've found myself buying more and more secondhand, remaindered and new texts as the novelty of the e-reader wears off and as I re-discover the thrill of holding a nice edition in my hands. It's my guess that e-texts will go nuts for the next few years and that publishers and booksellers will grow more and more depressed but I think that the situation will even out eventually. My theory is that the legions of digerati will, like me, grow tired of reading on their machines every day and will decide to buy some books in e- format and some in regular print format. A throwaway airport novel might lend itself for an e-read but a nice edition of that same novel might be used as a present for a friend or simply as something for the shelves. If I were a rich person I'd go around buying up all the plums of the remaindered stock, store it for a few years and bring it back when demand resumes as it will. Look at the resurgence of vinyl. Don't you wish you'd gone around buying up all the vinyl that radio stations around the world were throwing out? 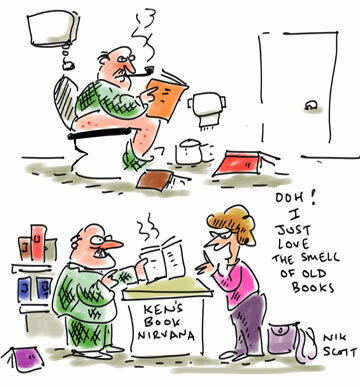 E-books, I feel, will remain as very useful for an instant read but they will not take over in the long run. There’s no doubt they'll make a huge impact but I'd bet $10 and a shiny red apple that regular books will become even more desirable once the dust settles. Stay strong. Things will get better but it’ll take a good five to ten years.